This article first appeared in Escape From America magazine. Each year, 12 million people jet off to Niagara Falls. Some go to wed, some to relive their honeymoon (it’s not for nothing that it’s dubbed ‘Viagra Falls’ or a spot for ‘newly weds and nearly deads’) and some simply because it has to be done. It’s one of the Northern hemisphere’s greatest natural wonders – to be ticked off alongside the Grand Canyon, the Rockies and a cruise around Alaska’s glaciers. The Falls themselves are bewitching in a quite unexplainable fashion. Yes, we’re all ready to be impressed by their size and their beauty but their allure extends far beyond the photogenic. Their raw power is so hypnotic that it’s no surprise to learn that around 20 people each year choose this location to jump to their deaths. If you happen to be feeling undecided, it’s probably not the place to test your will. You stand before them and your entire being dwindles to little more than a wisp of puff. Perhaps this is what makes them the ideal wedding backdrop – only love is a match for their elemental force. Ignore jokes that the Falls are ‘the bride’s second disappointment’ – only the soulless fail to be moved. They are 12,000 yrs old and the second largest in the world – after South Africa’s Victoria Falls. The Angel Falls in Venezuela are the highest but Niagara’s huge volume of water is what makes it impressive. 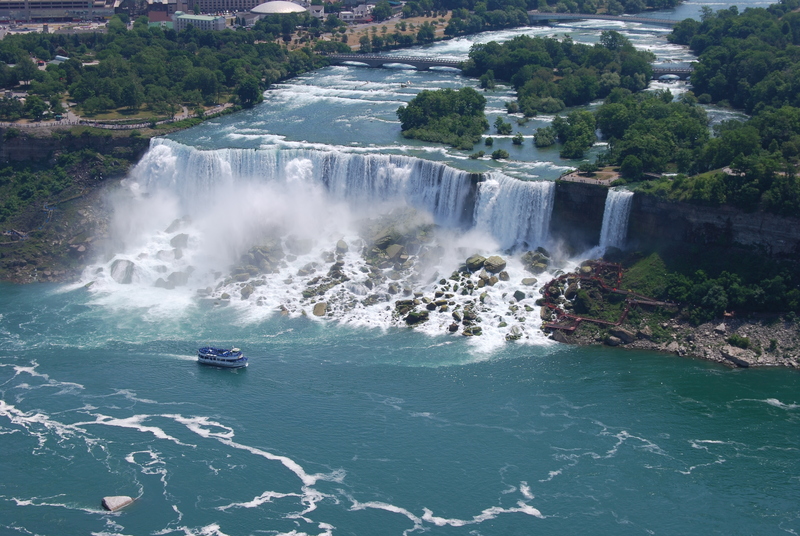 In fact, Niagara Falls encompasses three separate cascades: the American Falls (850 feet wide), the Bridal Veil Falls (just 50 feet and also on the American side) and the well-known Canadian Horseshoe Falls (2200 feet wide). Around 600,000 gallons go over each second, from which comes Niagara’s name: ‘Thunder of Waters’ in the original Indian language. Another truly memorable – and dramatic – way to sample the panorama is from the air. Jump into a 6 man helicopter and be whisked off to view the mighty Falls from your own eagle-eyed perspective. 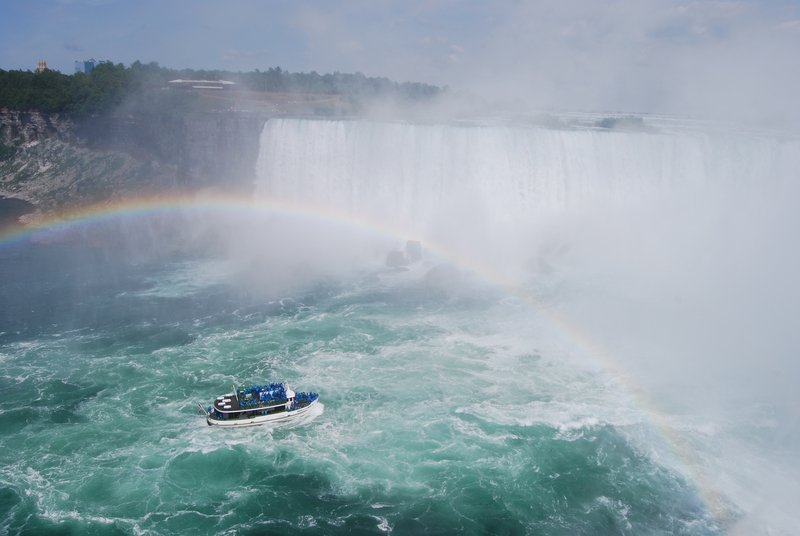 You can take a Rainbow Air helicopter from the American side (www.rainbowairinc.com) or a National Helicopter from Niagara-on-the-Lake (905-641-2222). Niagara Helicopter Rides offers a cheaper alternative, with a thrilling 8 minutes in the air (Victoria Ave, Niagara Falls – 905 357 5672). A more sedate choice is the Flight of Angels tethered balloon, on the American side. The helium filled fantasy rises to 400 feet, overlooking the Gorge and the Falls (716/278-0824). 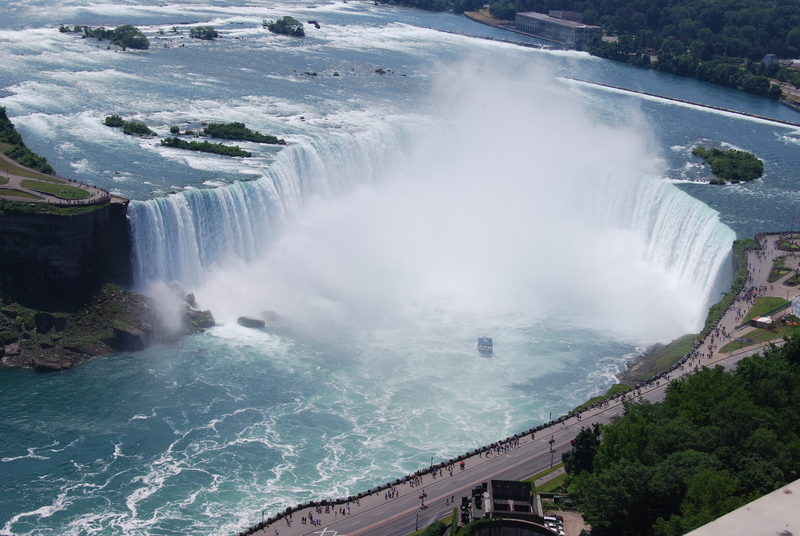 Other unusual ways to view the Falls…..
Another novel way to enjoy the scenery is from the Niagara SkyWheel. Ascend over 175 feet in a gentle arc aboard one of its 42 enclosed gondolas – each can take up to 6 people. The ride lasts just ten minutes but will leave you feeling delightfully tranquil. You float off the other end, basking in the afterglow of having taken yet more fabulous Falls shots for the album. Your other opportunity to pop on a rain poncho comes at the Journey Behind the Falls – located under Table Rock House at the very brink of the Horseshoe Falls. An elevator drops you down 151 feet; tunnels then take you through solid rock to viewing arches directly behind the Falls’ curtain. The noise created by the rush of water is staggering. You can also stand on a deck, just a few feet away from the lower edges of the cascade. It’s not the most comfortable location – being windy, very wet and quite deafening – but it’s strangely compelling. Tearing yourself away simply to grab another ice-cream up above or peruse the souvenir shop seems like madness; drink in every moment. 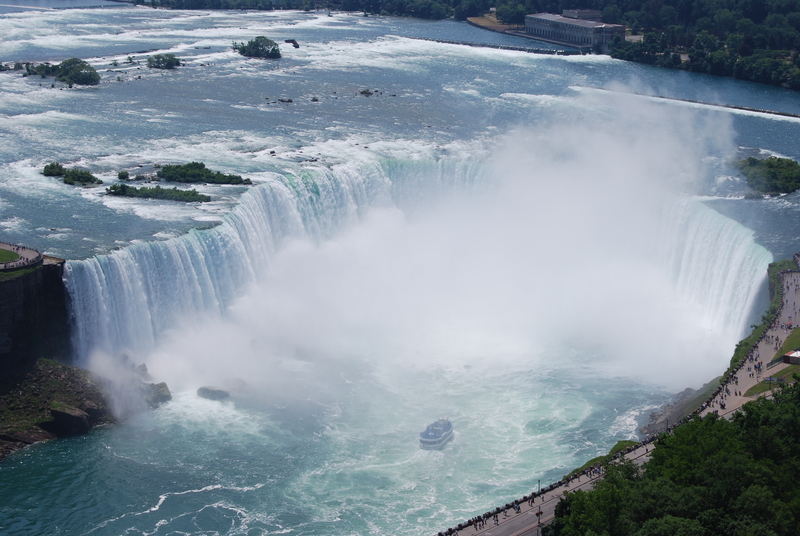 You can even enjoy the Falls while sitting in a darkened room – courtesy of the IMAX Theater – not far from the Skylon Tower (www.imaxniagara.com). Watch the raging waters on a six story high screen. It’s not cheap for a 45 minute film – but is certainly unique (is said to be the 2nd most watched IMAX film ever). In 1918, a sand barge broke loose from its towing tug with two men aboard and drifted towards the edge of the Falls. The brave souls managed not to panic however; they opened the vessel’s lower dumping doors, allowing it to ground itself on a rocky ledge. After an excruciating 29 hours, they were rescued by a line cast out to them from the nearby Hydro-Power Station. The scow has remained there ever since, almost within spitting distance of the crest of the Horseshoe Falls. Each year, it rusts a little more and people place bets as to when it’ll finally go over. The Falls are even more breathtaking once dusk has fallen. Twenty two xenon gas spotlights (250 million candlepower each) illuminate the cascades in shades of violet, green, rose, magenta and topaz – it’s completely over the top yet it works beautifully, ensuring the promenade is just as bustling throughout the evening. In winter, the lights begin around 5pm (8:30pm in spring and fall and 9pm in summer). From mid May to early September, there is also a free firework display every Friday and Sunday night at 10pm. (plus Wednesdays in July and August and Fridays alone until October 5). Extra displays are put on for Victoria Day -May 21, Memorial Day -May 28, Canada Day -July 1, U.S. Independence Day -July 4 and the Canadian Civic Holiday -August 6. Is it a good idea to visit the Falls in winter? If you don’t mind wrapping up warm, then Niagara is still a great place to go in the colder months. In fact, finding a good room over the Christmas and New Year period is almost impossible unless you book well ahead and are ready to pay a princely sum. The huge volume of mist from the Falls crystallizes in a picturesque fashion on trees along the shoreline, creating a pretty winter wonderland. Frost has never stopped the Falls altogether but an ice bridge does tend to form at the base from late December to late February (caused by ice from Lake Erie traveling over and building up at the bottom – up to 80 feet thick). Tourists would regularly go for a jaunt on the ice – until three people were swept away on a floe in 1912; walking out is now taboo. The American Falls, being much narrower, are more likely to freeze. The Horseshoe Falls have only once been significantly affected; in 1848, an ice jam at the mouth of the River caused flow to be severely restricted and they were reduced to a trickle for just over a day. Locals were disturbed by the sudden silence that descended on the town – having been used to living with the constant roar; some even believed that the end of the world might be approaching. This didn’t stop them making their way onto the riverbed though; they picked up artefacts that had lain hidden for centuries – bayonets, tomahawks and other 1812 weaponry. On a practical note, Maid of the Mist staff nipped out to blast away rocks which had been impeding their cruises. Sadly, the Maid stops running towards the end of October and doesn’t open again until late April at best. However, the town has wisely invested in night time illuminations for the whole 5km promenade. These beautify the town all year round but are especially fabulous during the Festival of Lights; 3 million bulbs pull in crowds from November to January. Don’t miss the world’s largest illuminated Canadian-American Flag! Why do people knowingly send themselves over the Falls – in a barrel, kayak or otherwise? Are they brave or simply foolhardy? Some, no doubt, are banking on their 15 minutes of fame. Most strike us as one sandwich short of a picnic. A lack of fear isn’t always quite what it’s cracked up to be of course. Of the 16 stuntmen and women who have gone over, only 11 have survived. Tip one: What are you thinking? Book a psychiatric appointment immediately. No one in their right mind would want to find themselves plunging over the Falls. Can’t you get your kicks by cutting out supermarket coupons and buying the occasional lotto ticket like the rest of us? For those intent on using up several if not all of their nine lives…….. Tip two: Since you’ll be freefalling with the force of 600,000 gallons of water per second landing on your head, it’s advisable to build a strong vessel for your jaunt – inside padding often works well. Of course, it won’t be the fall that kills you so much as your landing; once over the 170-foot Horseshoe Falls, you face another 180 feet of water in the churning pool below. You’ll be flung around like a cat in a washing machine. Tip three: Pack an oxygen tank or two. Assuming your lungs are still in working order, be prepared for a stint under water. Tip four: Take a two-way radio; you’ll be able to chat to your pals in what could be your final moments. Tip five: Try not to throw up. You’ll be traveling at 75mph in a confined space; need I say more. Tip six: Pray you don’t drift over to the American Falls. You’ll be heading for a huge pile of rocks at the bottom. No one has ever survived. Tip seven: Don’t be tempted to go over without a ‘vehicle’ of some kind. Most of those who gaily jump over with the intention of meeting their maker are successful. The few exceptions to this rule have included a 7 year old boy in 1960 (who fell out of a boat) and one Mr. Jones in 2003. He and his friend got boozed up and decided it would be a great jape. Sadly, the friend was too sozzled to work the video camera – so their stunt went unrecorded. Tip eight: Have a wad of cash ready to pay your fine – up to $25,000 (this pays for the emergency services to rescue you). The Great Blondin (Jean Francois Gravelot) was the best known of Niagara’s tightrope walkers. In 1859, he stretched a 1,100 foot long rope across the water and tottered across in 20 minutes. Not content with this, he introduced bizarre novelties such as pushing a wheelbarrow before him, climbing on a chair halfway, shackling himself in chains for the trip and, even, cooking a meal on a portable stove, which he then lowered to a boat waiting below. He returned the following summer to entertain thousands of tourists with similar high jinx – including scampering over with the Prince of Wales’ assistant on his back. He continued to defy death until the grand age of 68 and died peacefully in his bed at 73. Let’s hear a round of applause for Annie Edson Taylor, the first person to think of going over in a barrel. In 1901, the retired schoolteacher hired a manager to publicize her dive and took her cat along for company. She came out the other side with nothing more than a small bump on her head, despite the Falls having four times the volume of water that they do today. It seemed like an interesting way to spend her 63rd birthday. In 1911, Bobby Leach, from Cornwall in England, was less fortunate. He broke both his kneecaps and his jaw. Once out of hospital, he toured the world with his trusty barrel but came unstuck in New Zealand. Slipping on orange peel, he fractured his leg. He then developed gangrene, had his leg amputated and died of complications. Another Englishman – Charles Stephens – had a go in 1920. He strapped himself in and placed an anvil at his feet as ballast. Unfortunately, this broke through the bottom of the barrel, dragging him to a watery grave. His right arm, still strapped to his harness, was the only part of him to ever be recovered. Frenchman Jean Lussier spent his life savings building a 6 foot rubber ball for his jaunt over the Falls in 1928. He recouped his costs by selling pieces of the ball (which later came to resemble chunks of car tires) ever after. Greek waiter George Statakis, from New York, took his pet turtle with him in 1930. Rather unluckily, his barrel was trapped behind the curtain of water for 18 hours and he ran out of air. His turtle was found alive and well but refrained from selling its story to the press. Local man William Hill Jr made his craft – ‘The Thing’ – in 1951. Sadly, it broke apart and his battered body was recovered the next day, leading to public stunting being declared illegal. Nathan Boya, from the Bronx, was the first African American to go over, in 1961. He used a ball similar to Lussier’s – named the ‘Plunge-O-Sphere’ and went over relatively unscathed. The first Canadian to succumb to the lure of the Falls was Karel Soucek. In 1984, his adventure resulted in no more than a few cuts to his face from his wristwatch (and a fine). Some people just don’t know when to quit; he died the following year while re-enacting the stunt at the Houston Astrodome. David Munday had such a fabulous time going over in 1985 that he made a second attempt in 1990. Rather embarrassingly, he became stuck on the brink and had to be removed by a crane. Undeterred, he tried again in 1993 and made it out the other side alive. He was the first to survive the double whammy. Steve Trotter – a part time bartender – built his barrel from two Greek pickle barrels and padded the inside with material usually reserved for cushioning nuclear warheads on the move. He went over in 1985 and 1995, taking his equally fearless girlfriend, Lori Martin, over with him the second time. In 1995, Robert Overcracker opted for a dramatic alternative: a jetski and a parachute. He shot over the edge as planned but his parachute refused to co-operate. His body was never recovered. To learn more, pop into Niagara’s Daredevil Museum; you can even view some of the barrels used. Unsurprisingly, fish are better built for a trip over the Falls than us humans. Foremost, they can breathe underwater – certainly an advantage. Secondly, their bendy little bodies can fly through the cascades without too much damage. The downside for them is that, as they hit the water below, their fishy brains are temporarily stunned and they forget to swim down deep, away from the seagulls awaiting their dinner. Most do survive though. Less fortunate are the ducks who inadvertently go over – apparently a recurring problem on foggy days. 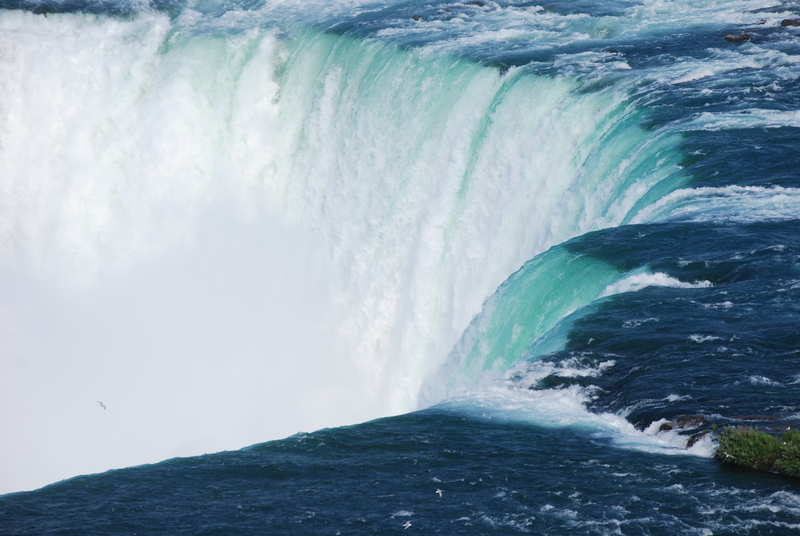 The Horseshoe Falls used to erode at about 3.8 feet each year – gradually moving back towards Lake Erie. Luckily, diverting a large quantity of water to hydro-electric power plants reduced this to 2.3 feet and today’s anti-erosion steps (shoring up rock with iron rods) has halted the loss to around 1 foot annually. It may take several centuries but, eventually, the Falls are likely to reach back to the lake. People have been posing for a shot of themselves against the Falls since photography first began in the mid 19th Century. 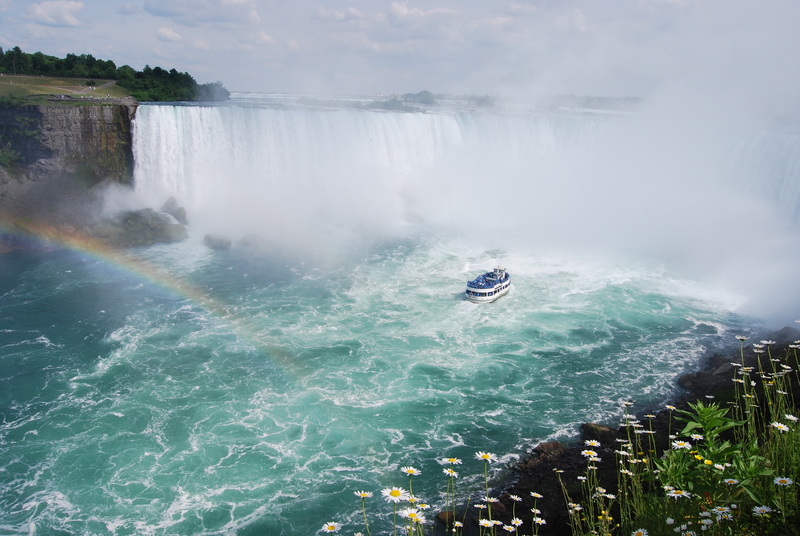 A trip to Niagara wouldn’t be complete without your own selection of pictures – so don’t forget your camera. You can snap the Falls from so many angles and the view changes greatly depending on the time of day and the weather. The American side versus the Canadian – how do you choose? 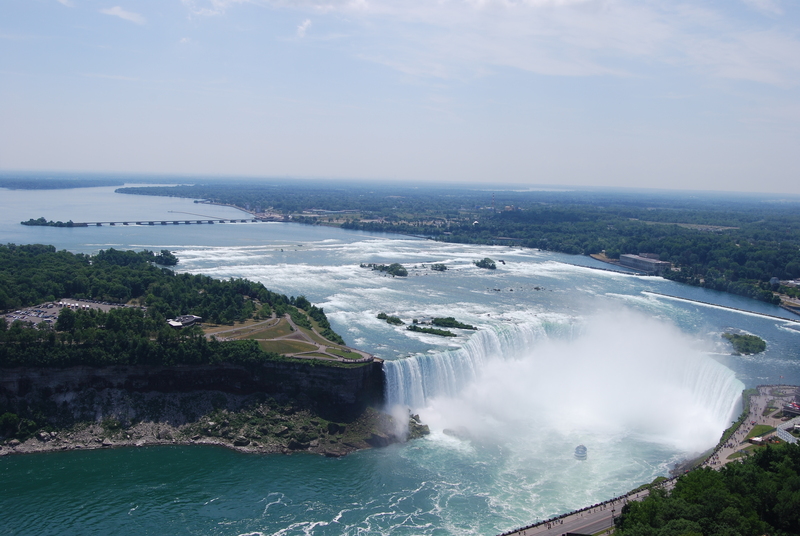 Most people choose the Canadian side, since it offers a better view of the Horseshoe Falls and has 1000% more kitsch to keep you amused; imagine the glitz of Coney Island or the UK’s Blackpool. Those who prefer a more refined experience often choose to locate themselves at quaint Niagara-on-the-Lake; its 19th-century architecture is second to none. From there, you can drive to the Falls in around 20 minutes. The American side has its charms, too, attracting 5-6 million visitors (compared to the Canadians’ 12m). You still have the option of taking the Maid of the Mist boat ride, or walking down to the ‘Cave of Winds’ – a walkway around the base of the American Falls and behind the Bridal Veil Falls. You can also stroll across to Goat Island (surrounded by such fierce rapids that it was considered for an Alcatraz-style prison). Its beautiful park reserve is the oldest in the States – designed by Frederick Law Olmsted. You can also pay a visit to the Aerospace Museum, see the Aquarium or tour the Old Fort (peopled by historical re-enactors in 18th century period costume). Additionally, the town has over 150 fashion outlets with big designer names (a free shuttle bus operates) – don’t forget your credit card! Another advantage is that it’s much cheaper to fly from the US into Buffalo rather than Toronto. 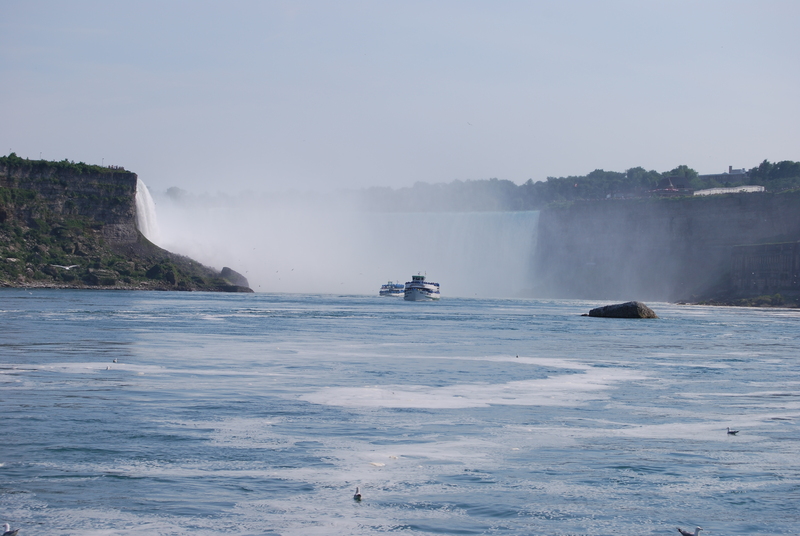 Of course, you can always take a shuttle or cab from Buffalo to your hotel on the Canadian side of the Falls (or walk across the Rainbow Bridge from NY state Niagara to the Canadian side each day). More excitement awaits you on the Whirlpool Jet boat. It departs from Niagara on the Lake and from Lewiston on the US side. Throughout the summer, you can be shaken, stirred and licensed to enjoy the thrill, darting with abandon across the class five rapids of Devil’s Hole. The jet boats travel at speeds of up to 60mph, wheeling daringly close to the edges of the gorge. Expect to stagger off with jelly legs and dripping hair. Despite the fetching water proof poncho and aqua booties, you’re likely to clamber back onto land rather on the soggy side. Don’t fancy getting wet? Take the covered ‘Jet Dome’ option. It costs C$56 for adults and C$47 for those 13 and under. 6 year olds (at least 44 inches tall) can take the wet boat ride while 4-5 year olds (at least 40 inches) can try the covered boat. (www.whirlpooljet.com) If jet boating sounds far too ‘Formula One’ for your liking, try the White Water Walk. Take a tiny elevator 230 feet down to the base of the gorge, enabling you to stroll along a boardwalk close to seething class 6 rapids. Non-vertigo sufferers might enjoy the Whirlpool Aero Car – a Spanish cable car which crosses from one side of the Niagara Whirlpool to the other. The mysterious waters swirl and twist upon themselves some 250 feet below. It’s a mesmerizing sight. View the rapids, the Whirlpool, the Gorge, and the hydro-electric plants during the ten minute trip. It’s located 3 miles down river from the Horseshoe Falls and the car holds a maximum of 35 people. 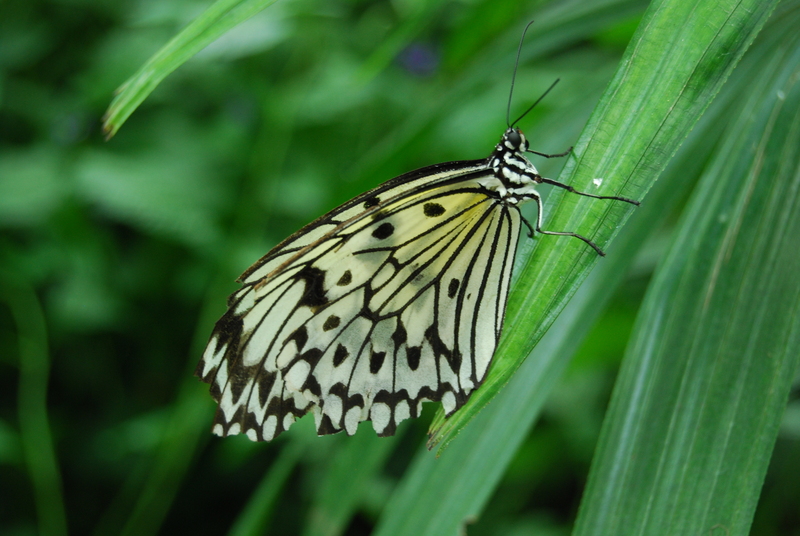 A short drive from the Falls is North America’s largest glass Butterfly Conservatory. 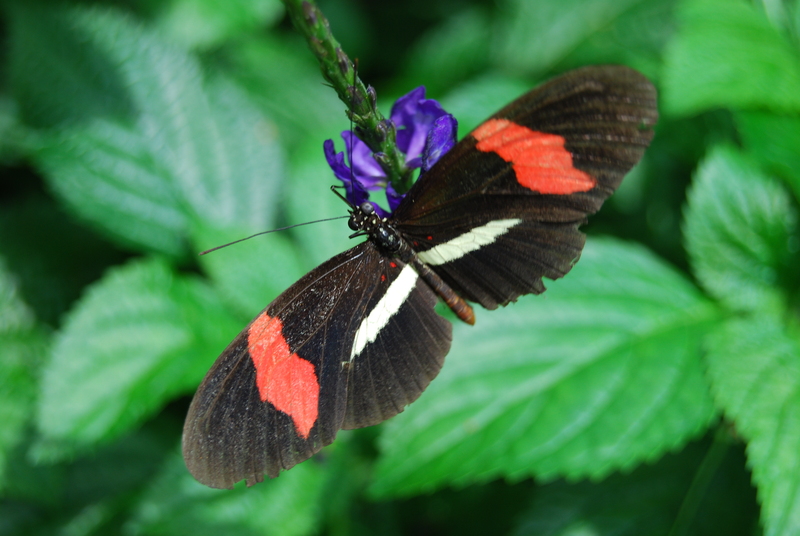 11,000 square feet of tropical rainforest plays host to exotic flora and these exquisite winged creatures. 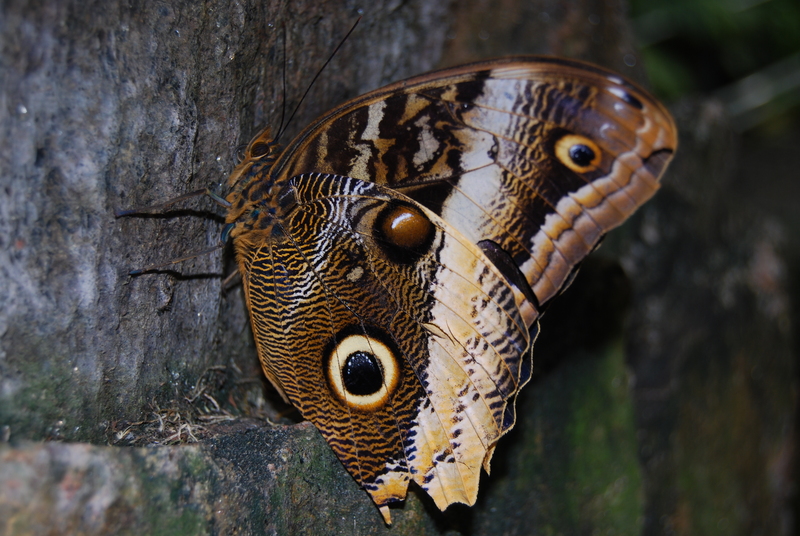 They are free to flutter in the humid enclosure, giving you the chance to study them up close. You may even find one or two alight on your shoulder – especially if you are wearing a brightly colored outfit. This is said to be very lucky; each landing is worth at least one trip to a Niagara casino! The man made waterfall and winding pathways add to the charming atmosphere inside the building. You can easily spend an hour here – more if you are a keen photographer; the butterflies’ iridescent wings cry out to be captured on film. The Niagara Falls’ Bird Kingdom is the world’s largest indoor, free flying Aviary, within a few minutes walk of the Falls. Almost 500 birds and 80 species (many of them endangered in the wild) make their home here. You can walk through as the birds swoop around your head. The main atrium has a multi-level rainforest environment – with 35 foot tall palm trees, a 40 foot waterfall and several ponds and streams; it’s unique. To encourage the nocturnal birds and animals to strut their stuff, the site has a specially darkened ‘ancient jungle ruin’ room. Bats, owls and other creatures of the moon spend their nights under artificial lighting (to encourage them to sleep) – turning them into chirpy critters in the fake night of daytime viewing. What’s a little internal clock reversal in the name of public entertainment? Watch the Egyptian Fruit Bats feeding every day at 10:30am and 2:30pm, have your photo taken with a jolly parrot on your head, let a parakeet nibble seed from your hand or get intimate with palm sized lizards – the fun is never-ending. If taking a gentle promenade through lush flower filled gardens is more your style, then you’ll be in seventh heaven at the Botanical Gardens. You could spend several days soaking up the atmosphere; there’s 99 acres to explore – with a huge rose garden, ornamental trees and shrubs, herbs and vegetables, a formal parterre and sumptuous rhododendrons and azaleas. It opened in 1936 and has been a visual feast ever since. Linger amongst the dazzling displays, savor the tranquility of the ponds or take a horse & carriage tour. The Gardens are partly maintained by students from the resident School of Horticulture. Meanwhile, Queen Victoria Park runs adjacent to the Horseshoe Falls, with plenty of benches along the way to allow you to rest awhile and admire the views. Its colorful blooms and lush lawns are certainly inviting. Lots of people simply set themselves up under the shade of a tree and have a leisurely picnic. The Loch Ness Links Course: with an authentic Scottish feel, ravines, ponds and hills. It overlooks the Welland Canal – offering views of passing sea-faring ships. Don some tartan shorts and keep eyes peeled for Nessie. The River Course at Grand Niagara Resort: 320 acres of picturesque tree lined fairways and sparkling ponds. It offers plenty of challenge for the experienced. The Legends on the Niagara Battlefield Course: lives up to its name with a selection of bunkers and water hazards to lure you into trouble. An 1812 battle was fought just adjacent to the course. The Usher’s Creek Course: following a natural stream through the woods. Expect to beat your way out of the rough a few times. Public Golf Course: super views and fairways designed by the Toronto Terror (Stanley Thompson). There are several casinos on the Canadian side, lending it the nickname of ‘the Las Vegas of the East’. 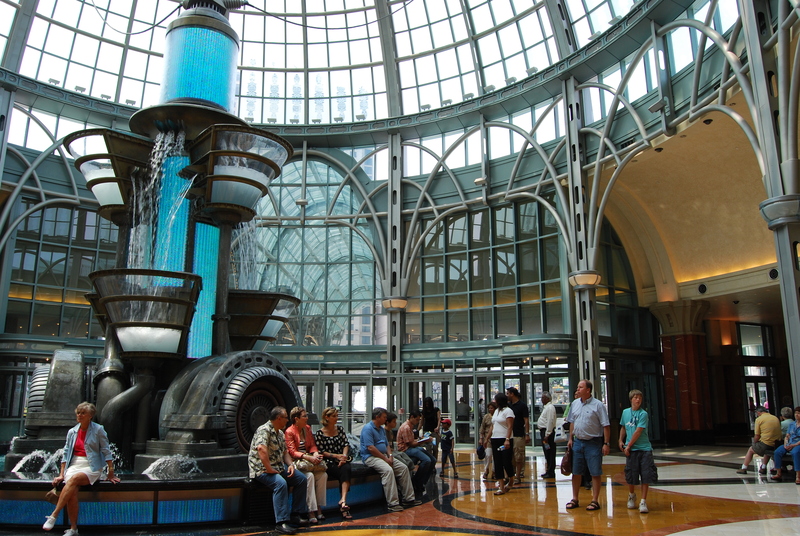 The new Fallsview Casino Resort – complete with a huge shopping mall of boutiques and a host of chic cafes and eateries – is the most impressive; it has the largest gaming floor in Canada. It’s worth a walk around inside to revel in the dazzling beauty of the interior – a marvel of glass, marble, gilt and glamour. If you fancy your hand in the gaming rooms, there are 150 tables and 3000 slots to choose from, covering 180,000 square feet. The hand painted ceilings and unusual ornaments aim to conjure up the ambience of olde-Europe. Any genuine European would be sure to scoff at this but might concede that the Fallsview Casino has its own grandeur. No expense was spared to make this a memorable venue. For shows, check out the 1500 seat Avalon Ballroom (featuring the likes of Aretha Franklin, Tom Jones, Lionel Richie, LeAnn Rimes and Bonnie Tyler). Meanwhile, its 365 club has free concerts in its cocktail bar every night of the year – predominantly jazz and blues. Its nearest rival is Casino Niagara near Clifton Hill. It’s rather more down market – but meets the expected quota of bell-ringing, coin dropping thrills. On the American side is the Seneca Niagara Casino. $80 million was spent on revamping the old Convention and Civic Centre – it’s no match for the Fallsview Casino but has its own share of buzz and excitement. Niagara’s most popular nightclub is Rumours. Forget your inhibitions on the happy-go-lucky dance floor. The provincial clientele, cheesy video screens and ‘trying too hard’ laser show may leave New York clubbers sniggering but most people there are having a whale of a time. The Hard Rock Club has a slightly different vibe. Its 60s plush velvet is complimented by the world’s largest disco ball. One of the newer additions is the Dragonfly Nightclub, inside the Fallsview Casino Resort. It has an ample 12,000 square foot dance floor and employs guest DJs from around the world; needless to say, it has the latest in sound and lighting. If you fancy a bit of live entertainment before donning your dancing shoes, there’s Yuk Yuk’s and the House of Comedy to choose from. Alternatively, head to the Sports Zone for bowling, video games, billiards or a spot of sports watching on its 6 huge bar mounted TV screens. Forget all notions of taste or restraint. Let the flashing neon lift you to a higher plane: one in which ghouls, dinosaurs and a wax image of the Pope vie for your attention. Having just one wax museum clearly wasn’t deemed sufficient: you can choose from the Movieland version – with characters from Indiana Jones, the Wizard of Oz, Harry Potter and Austin Powers, each set in a suitable scene from their film – or the Louis Tussaud museum. The latter boasts more than a hundred figures. Visitors are welcome to pose for photos with their favourites and the Movieland site offers an usual souvenir idea – having a wax replica made of your own hand. Fairground lovers will want to sample the Cosmic Coaster Ride, which offers a fusion of ‘the Grand Canyon and Outer Space’; the moving car seats up to 38 people and takes you on an 8 minute simulation (littlies can have a non-moving seat). Continue the fun with the Ghostblasters Ride through a haunted house, shooting the spooks and spectres with your own laser gun. If you like that sort of thing, the Guinness Book of Records Museum is a rather good example of its kind, sporting life-sized models of the planet’s most extra ordinary humans. See a replica of Robert Wadlow – the world’s tallest man, at 8 feet 11.1 inches – and another of the most tattooed woman. More fascinating facts than you can shake a stick at. In the same vein is Ripley’s Believe it or Not! Mr. Ripley spent a lifetime collecting unusual items and managed to visit 198 countries. The museum houses over 500 artefacts – including some used by Niagara’s own daredevils, alongside film footage of their exploits. Ripley’s 4D Moving Theatre boast a 6 channel surround sound system and a huge screen, with seats that move in 8 directions. Beware stuffing yourself with the ever present chips, ice-cream or burgers before climbing aboard. Of course, no such avenue would be complete without a spot of mini-golf. Dads can flex their competitive muscles against the cheating ardour of their children at Dinosaur Mini Putting. Its 18 holes are surrounded by lush vegetation and include a few sand and water hazards along the way. With a par of 40, it takes around 30-40 minutes to play. Having fibre-glass replicas of Tyrannosaurus Rex beam down at you only enhances the pleasure, naturally. If the weather is looking dodgy, you might want to opt for an indoor version at Galaxy Golf Indoor Mini Putt. It promises a ‘glow in the dark space adventure’. At least a hundred shops jostle for your dollars at Niagara, most selling items that will seem highly questionable within 24 hours of your return. It’s hard to resist buying the odd ghastly souvenir however – they exert a magnetic influence, particularly potent on anyone under the age of 11 or over the age of 65. Among the more remarkable venues is the Hershey Store: the only one of its kind. If you like their chocolate, the 4 story building’s 7,000 square feet of confectionary will have you spinning in your tracks. A giant Hershey’s Kiss perches on the corner of the building, just in case you’ve missed the sign. Free samples of fudge are on offer, alongside strawberries dipped in chocolate and ‘signature Hershey milkshakes’. For the truly greedy, there’s a 5 lb. Hershey Bar for sale. Life-size Hershey Kiss characters wander about the retro style interior, which sports vintage photographs and nostalgic collectibles. Another sweet temptation is the Fudge Factory. Their freshly made fudge comes in every flavor imaginable and really is amazingly delicious. You can watch it being made (alongside Candy Apples and – strangely – Beernuts). Movie buffs will be drawn to the MGM Retail Store, which sells a wide selection of its archive on DVD, with CDs of film soundtracks to boot. Movie memorabilia abounds. On a different note, there’s the world’s only World Wrestling Entertainment Store. Buy some wrestling outfits so you can re-enact the battles of your favorite characters at home. The store is set out like a WWE arena, with posters of the superstars and Royal Rumble video games on giant screens. You can watch the latest ‘Pay Per View’ events or try the PileDriver Drop Ride (shoot up 200 feet in the air and then plummet back to earth screaming). 50,000 people a year travel here to say ‘I do’. It all began when a certain Theodosia Burr (daughter of a future US Vice President) chose the Falls for her honeymoon. It soon became all the rage. Just three years later, Napoleon Bonaparte’s brother, Jerome, took his beloved there for a spot of Niagara loving. If you are in any doubt about your other half’s intentions, it may be a destination to avoid of course. Hitchcock’s ‘Niagara’ showed Marilyn Monroe’s femme fatale plotting to push her new husband into the raging torrent. Alongside anywhere with a cliff, the Falls are the perfect site for ‘accidental’ death. On the flip side, their raw power is a sure-fire aphrodisiac; it’s no wonder that people often choose the Falls for a second honeymoon. The 23rd floor of the Marriot Fallsview and the Skylon Tower both make fabulous spots to hold a reception. For help organizing your event, view http://www.weddingcompanyniagara.com. For an outdoor ceremony, consider a pretty gazebo at Niagara-on-the-Lake or say your vows in the beautiful Botanic Gardens; www.occasionsniagara.com can advise. Hotels began vying for business as far back as the 1820s. In those days, there were just three hotels. Their owners contrived Niagara’s first ever stunt – one which may put animal lovers into a swoon. Two bears, two raccoons, a buffalo, a dog and a goose were placed in an old schooner and sent tumbling over the Falls in 1827. Ten thousand people turned out to watch the poor beasties tumble to their fate. The bears were running loose on the deck, so managed to swim to safety but, of the others, only the goose survived the plunge. These days, Niagara’s hostelries prefer to lure us in with jacuzzis, waterbeds and all you can eat buffet breakfasts. Jump online to check out who’s offering the best deal for your chosen dates. You’ll be spoilt for choice but Tim Hortons – right by the Falls – is a super choice for cheap lunchtime sandwiches and snacks. In the warmer months, it’s nice to sit outside and enjoy the sunshine of course. Take a seat at the Falls and Firkin (just outside the Niagara Fallsview Casino Resort). It serves traditional ‘English Pub Grub’: steak and Guinness pie, fish and chips and other hearty treats. Of course, there are plenty of familiar names to choose from: the Hard Rock Café, Wendy’s, TGI Fridays and Planet Hollywood to name a few. The Skylon and Minolta Tower restaurants offer the best views but, for a culinary treat, head to Casa Mia (3518 Portage Rd). If your hotel gives them a ring, they’ll send a taxi for you free of charge. This authentic Italian is elegant yet cosy, the food is amazing and they have live jazz on Friday and Saturdays. There’s plenty of choice when it comes to flying. Several airlines operate and there are regular services throughout the day (but do remember, it’s cheaper to fly into Buffalo and then take a shuttle to the Canadian side, than it is to fly directly into Toronto from the US). Most people only come to Niagara for the weekend but there are enough activities to keep you going for far longer. You may simply want to drink in the beauty of those waterfalls and indulge in some spa treatments and fine dining with your loved one but, if you have more time, do visit the vineyards or play a round of golf or two. Nature lovers shouldn’t miss the Aviary or Butterfly Centre while others will have the time of their lives revelling in the bizarre fun of Clifton Hill, raving it up in the clubs and gambling themselves silly. There’s certainly sufficient to keep anyone amused (whatever their budget or interests) and the Falls are no more than a short hop from most cities along the Eastern side of North America.